October 18th 5:30-8pm at Platt Forum, 2400 Curtis St.
For 50 years Bayaud Enterprises has been an innovator in the community in reducing barriers for individuals to engage in the workforce and attain self-sufficiency. 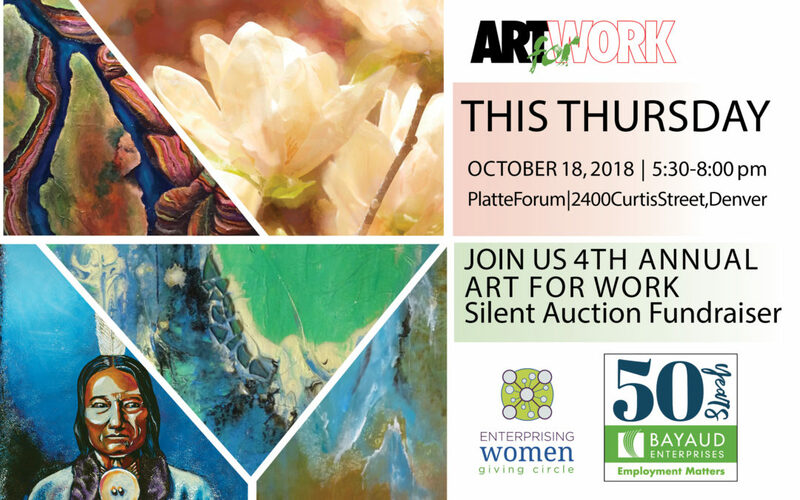 We couldn’t do this work without your help and this silent auction fundraiser is a great way to help us achieve our goals while also getting a beautiful piece of art! This event brings together a cross section of art lovers, artists, human service professionals, business professionals as well as many other leaders in the community. It is an amazing evening of networking and entertainment for a great cause. Join us this year to make our 4th year of Art For Work our best!